Earn 10% cash back on everyday purchases for the first 3 months (up to $200). Plus your first year annual fee waived – a value of up to $299 in the first year. Welcome Bonus :Earn 10% cash back on everyday purchases for the first 3 months (up to $200). Plus your first year annual fee waived – a value of up to $299 in the first year. *Applies to first $25,000 in purchases then 1% for all other purchases. 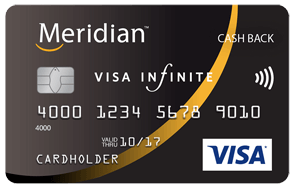 If you successfully apply for a Meridian Visa Infinite Cash Back Credit Card, during the Offer Period, and you are a first-time Meridian Visa Credit Cardholder, you will earn 10% cash back (the "Offer"). "Offer applies to a new account opened at any time between February 1, 2019, and April 30, 2019, (the "Offer Period"). You will earn 10% cash back (the "Offer") on the first $2,000 eligible purchases posted to your new Meridian Visa Infinite Cash Back Credit Card account beginning on the account open date and ending 3 months after that date (the "Offer End Date"). After the "Offer End Date" or once you have reached the $2,000 eligible purchases, you will earn regular cash back on purchases at the regular cash back rate described in the Meridian Cash Back Rewards Program associated with Meridian Visa Cash Back Credit Cards (the "Program") . Cash back earned under this Offer will be credited to your account so long as your account is open and in good standing at the time of payout . Bonus Cash Back Rate: The amount earned under the cash back bonus rate will be credited to your account within 2-3 months after the Offer End Date. All other terms of the Meridian Visa Infinite cash back program terms and conditions apply. Eligibility for rewards and/or account credit is subject to the terms and conditions of the Meridian Personal Cash Back Rewards. 10% introductory bonus cash back rewards offer is subject to completion and approval of full credit card application and credit review that may take up to 10 business days. Meridian Credit Union reserves the right to revoke this Offer at any time. Meridian will also agree to waive the normal annual fee for the credit card (for both primary and additional cards) for members who take up this offer ("First Year Free"). Interest rates for Meridian Visa Credit Cards are as follows: Purchase Interest rate: 19.50%, Cash Advance 21.99%, Balance Transfer: 19.50% as of January 1, 2019. Other fees and charges apply, visit meridiavisa.ca for full details. The Meridian Visa Card is issued by Collabria Financial Services Inc. in a joint partnership with Meridian Credit Union pursuant to a license from Visa. *Trademarks of Visa Int, used under license. ™Trademarks of Meridian Credit Union Limited. Offering a good amount of cash-back on select purchases, and with no annual fee for the first year, the Meridian™ Visa Infinite* Cash Back Card is an exciting option for anyone who likes free money! The high rate of cash-back is only capped after $25,000 in spending (if you have an average household spend, this shouldn't be a problem), and you'll earn cash-back for making everyday purchases, from groceries to utility bills. This wide range of eligible purchasing options means you can make cash-back quickly (other cash-back cards may have a higher cap, but offer less convenient shopping options). When you add in the Visa Infinite Benefits, this credit card becomes a very competitive option in the cash-back category. So, how does this card stack up to other cash-back options? We crunched the numbers using our Best of Finance methodology to see how much you could earn over a 24-month period. Cash-back earned over a 24-month period: $965.05. Total (subtracting annual fee): $866.05. Within two years of regular use, you can make enough cash-back to pay for a vacation, splurge on designer clothes, or just boost your savings account. Most rewards cards take longer than to generate enough points for serious purchases, but the Meridian™ Visa Infinite* Cash Back Card's wide scope of eligible purchasing options makes it an efficient cash-back tool! 4%* cash-back on gas and grocery purchases. 2%* cash-back on pharmacy purchases and utility bill payments. 1% cash-back on all other eligible purchases. You have flexible redemption options. Cash-back can be used towards an account credit, merchandise, event tickets and gift cards. Cardholders receive a comprehensive suite of insurance, including emergency health care coverage, purchase protection and extended warranty3, flight delay insurance2, trip cancellation insurance2, travel accident insurance2, mobile device insurance3 and more! Additional cards cost $30 each. The 4% and 2% cash-back rate only applies to first $25,000 in purchases. After that, you can only earn 1% cash-back on purchases. Relatively high eligibility requirements for this card means it is not for everyone. Upon applying, you must prove that you have $60,000 of annual personal income or $100,000 of annual household income to qualify for the card.